﻿﻿﻿﻿﻿﻿﻿﻿It seems when there is a lot going on in the reality of everyday life, computer time falls to the wayside, so it's been a while since my last post. ﻿﻿﻿﻿﻿﻿﻿Life is funny though, you never know what will peek your interest. So when ever I get to leave the house I take a camera and a sketch pad with me. Anything that happens to catch my eye, I snap a few reference photos. On an outing with my husband, we found an old rail road depot. While we walked around outside the depot (still standing but in disrepair from a fire) I noticed that some of the old rails laid on the ground next what was left of the old track. A plant with a purple flower growing right against an old rail caught my attention . I snapped a few pics, the flower, the ballast rock, the rails, any remnant of what was there long ago, rusting away. ﻿﻿﻿﻿﻿﻿Reviewing the photos, I noticed a rusted spike laying on the ballast was much more interesting the flower. I collected the photos with the most interesting rocks, collected a few similar rocks to put on my painting table and followed my muse. 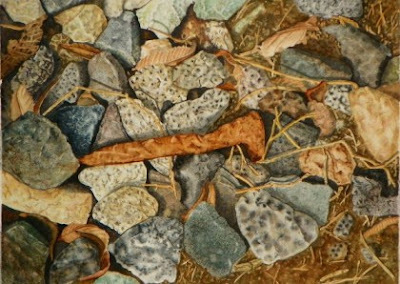 This rusty nail on a pile of dirty rock occupied my attention, as I tried to capture the textures and colors in the rocks, leaves, twigs and shadows. I worked on my shadows first, trying to break up the white paper and seperate the shapes. Then I began to "build" the rocks, laying background washed of color, diffrent for each rock. I then began to define shapes, features, colors and textures. Once the rocks and background were finished, I worked on the leaves, twigs and the spike, trying to keep the texture and depth as detailed as the rocks. As soon as the paper was dry and flat, the painting was framed, just in time to enter it and 2 other pieces in a local juried art show. To my excitement, I received a call telling me "Laid to Rust" won 2nd place. Coming in second only to my other entry "The Nesting Place". A very Good Day Indeed! !